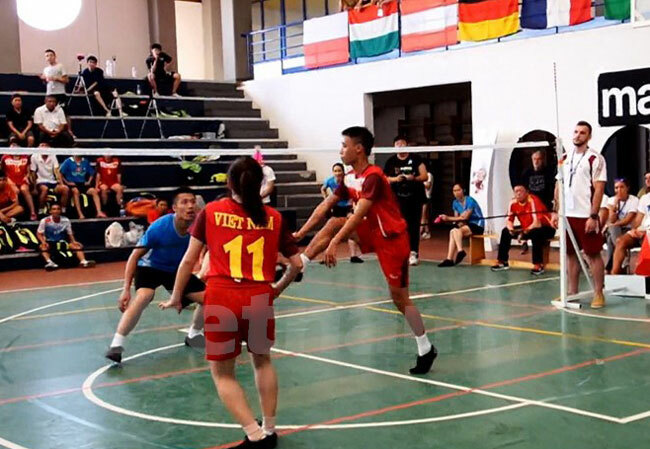 HA NOI (VNS) — Vietnamese team won the first silver medal at the ongoing World Shuttlecock Championships in Rome, Italy. Vu Tien Hung and Nguyen Thi Thuy Tien were defeated by the Chinese team 26-28, 19-21 in the mixed doubles class in the final. Previously, these two athletes had overwhelmed the players from Austria 21-8, 21-6 and those from Hungary 21-12, 21-15 to enter the final. This championship is considered as a rubbing championship of Vietnamese team for Asian Beach Games 2016 held in the central city of Da Nang. This eighth World Shuttlecock Championship, organised by the International Shuttlecock Federation (ISF), will conclude tomorrow. This year's championship has brought together nearly 100 athletes from nine countries and territories such as Austria, India, Poland, France, Germany, Hungary, and China's Macau. The athletes compete in seven contests, including mixed doubles, men's singles, women's singles, men's doubles, women's doubles, men's team and women's team (team of three).